Deep Purple and Alice Cooper are teaming up for a late summer tour of North America. The co-headlining run of 19 cities across the continent – with special guest The Edgar Winter Band – will begin in Las Vegas, NV on August 12, with shows currently set to wrap up September 10 in Cincinnati, OH and more dates to be announced. 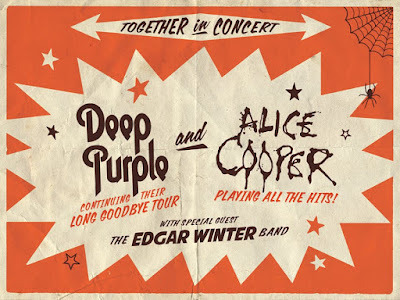 Over the past year, Cooper has been working on an album project with Ezrin and the surviving members of the original Alice Cooper Band – Michael Bruce, Dennis Dunaway and Neal Smith; no further details or possible timetable for release have been announced to date. An American Express card presale for the 2017 North American tour starts February 1 at noon local time, with a second presale opportunity via LiveNation.com, the Live Nation app and on Facebook begins February 2 at 10:00 a.m. local time. General public tickets will be available February 3 at LiveNation.com and via the Live Nation app.